Sleeping on tent decks under a canopy of massive redwoods, bonding with new friends while watching the starry night sky, laughing together at the craziest campfire skits, serenading the cooks at the end of a delicious meal… It’s not just the music but the whole Caz experience that gives kids a lifetime of incredible summer camp memories. Making music is Cazadero’s focus, but campers tell us the time they spend at Caz is about so much more. 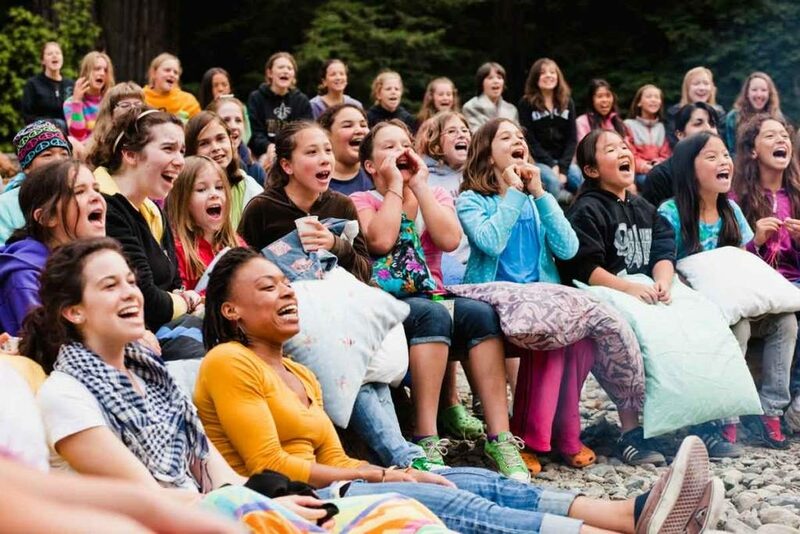 Living among ancient redwoods inspires campers to dream! Our environment allows students to engage more deeply in their music, and become inspired outside of the classroom. Time and again we hear that kids actually enjoy having time away from cell phones, computers, or other distractions. They are able to experience nature in a peaceful setting and take time to establish lifelong friendships. Caz campers work hard developing their musical ability, but they also have plenty of time to relax and enjoy being a camper. Typical daily schedules for each session are described here, or can be found in our Camper Handbook. Favorite camper downtime activities include swimming, ping pong, basketball, guided hikes, and more. Camp traditions, such as campfires, skit nights, and dances, infuse the camp with a special sense of camaraderie. Campers sleep under the stars on platform decks in supervised “units” assigned by gender and age. Clothing and instruments are stored inside the tents or dorm buildings. While rustic by design, the camp is fully equipped with indoor showers, toilets, and changing rooms, a dining hall, lodge, and a beautiful amphitheater that includes a professional stage, sound, and lighting. All meals (breakfast, lunch and dinner) are cooked from scratch and served buffet-style in the camp’s dining hall. Our fabulous cooks are happy to accommodate a variety of dietary restrictions, just include your requests on your Health History Form. On concert day, pre-concert lunches are offered for visiting families and friends at Café Caz. Be sure to make a reservation as space is limited. Our camp store is stocked with a variety of Caz apparel, supplies and treats. Campers may purchase CazWear logo clothing, replace their toothbrushes, or buy a treat for themselves during their free time. Campers can pay with cash, or parents can set up a store account for use during the session. The first day of each camp session begins promptly at 11:30 am. Parents may drive campers to the camp or bring campers to our Berkeley office to catch the bus. Cazadero’s bus leaves Berkeley at 9:00 am sharp (arrive by 8:30 for check in and loading) and gives campers a chance to start their camp experience even before they arrive at camp. The bus costs $40 and requires a reservation through our Berkeley office. There is no bus available for the return trip; parents should arrange to pick up their campers after the concert on the last day of camp. Medical Care: Resident nurses are on staff at all times to administer first aid and dispense camper’s medications. Paramedic response is approximately five minutes away and both the cities of Sebastopol (45 minute drive) and Santa Rosa (45 minute drive) have major hospitals. A drop-in clinic in Guerneville (10 minute drive) is available for the treatment of minor injuries. If your child has a special health condition or you have other questions please contact us. Camper Conduct: Campers at Cazadero are supervised at all times by highly qualified, trained faculty and staff members. We hold campers and staff to a high standard of conduct. Cazadero is a safe place both physically and emotionally for everyone. Homesickness: Some campers experience a brief period of homesickness. Most adjust to camp life within a day or so. In the rare event a camper’s homesickness becomes acute, rest assured we will contact parents. Parents who are concerned about homesickness are welcome to contact the camp director to discuss your child’s progress and our strategy for helping him or her adjust to an overnight camp.